Description: New genuine Acer laptop replacement battery. The specifications for this battery are 4605mAh, 52.5Wh, 3 Cell. This is a high quality original battery. Compatible Part #'s: KT.0030G.001, KT.0030G.013, (3ICP7/61/80), AC14A8L. 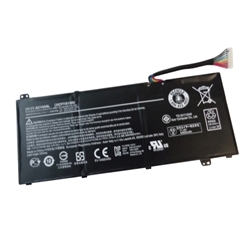 Acer Aspire VN7-571, VN7-571G, VN7-572, VN7-572G, VN7-591, VN7-591G, VN7-592, VN7-592G, VN7-591, VN7-591G, VN7-791, VN7-791G, VN7-792, VN7-792G.